Dr. Brigitte White Zivkovic, D.M.D. 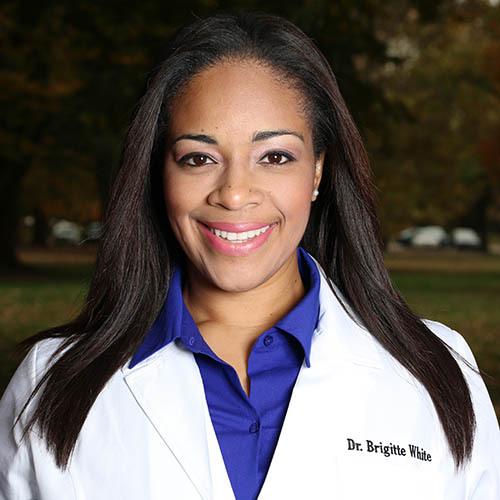 A native of Philadelphia, Dr. Brigitte White Zivkovic received her dental degree from the University of Pennsylvania School of Dental Medicine after completing her undergraduate education at Princeton University, where she majored in public policy and international affairs. Dr. White, as affectionately called by patients, has been in practice for over a decade and has experience in private practice, public health at Mary’s Center for Maternal Care, and also worked as a provider for the U.S. Army in Germany. Always a student of science discovery, Dr. White published research on Olfaction and Gustatory Function in the Annals of Neurology and she speaks both English and Spanish. In her free time, she enjoys traveling with her family and writing. She is the author of the young adult fiction novel All-American as well as a collection of Oral Care Children’s Books, which are available at Amazon.com, and she provides smile tips for all parts of life on her blog brightwhitesbydrwhite.com.